Enjoy the entertaining and mysterious ways that It's A Mystery has to offer. 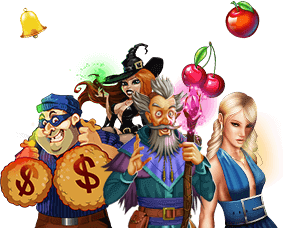 Crack the case and you'll be richly rewarded as you take on this delightful 25 line slot game. Visit the scene of the crime and search for as many clues as you can while you spend hours of fun in this suspenseful and intriguing slot game. You'll examine all the evidence and interview the mysterious Lords of the manor as you work your way through a game that will keep you at the edge of your chair, not only because of its intriguing story line but also because of the amazing prizes it has to offer. So, did the butler do it? Play now & find out in: It's a Mystery! It's a Mystery slot game contains 25 paylines and allows bets of up to $25 to be made. However, you can also bet as little as one cent per payline – it's up to your personal choice. To get started, the first thing to do is to enter the amount of your bet and the number of paylines you wish to play. It is important for you to keep an eye on the It's Mystery logo, since if you find three or more of those scatter symbols then the Portrait Puzzle Feature will be triggered. In this feature, players are shown a picture on a nine-piece puzzle. The puzzle is then shuffled once for each scatter symbol. Once the shuffling is completed the number of pieces in their correct place determines the amount of the player's payout. The feature offers winners up to 50 free spins and up 6x multiplier. The game also features RTG's popular win-win feature which allows players who don't win much in the bonus feature to try again for up to 100 times the bet which triggered the bonus game. You can try this feature on our Instant Play section, where you can play free slots without risking any money. As any other slot game, It's a Mystery is completely based on chance. However, knowing some tricks will certainly help you to make the most of your experience. Distribute your bets throughout the game. This way you will be able to play more rounds, and therefore your chances of winning increase considerably. Set your bankroll for the game. By doing this you will have control about how much you want to bet each round. Learn when to stop, this will help you to make the most of your experience, without regretting it later on. Wild symbol: In It's a Mystery, the wild symbol is the question mark which reveals the body when it appears in a winning combination. By getting two or more of these, you'll get to play the bonus game. Scatter symbol: The scatter symbol is the It's a Mystery logo, the Portrait Puzzle Feature is also activated by it, so be sure to keep an eye out for it. Bonus round: Bonus rounds are activated by landing on wild symbols and these rounds are usually an easy win. The bonus round in It's a Mystery can pay off very nicely but it isn't always easy to activate.